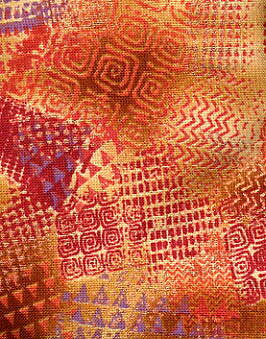 Copper, rust, orange, tangerine, wheat, brown, and dusty grape colors sculpt interesting patterns into the shapes of spirals, triangles, dashes, and wavy lines on the fabric of this bag. The copper is metallic and adds a special luxurious look to the entire bag. 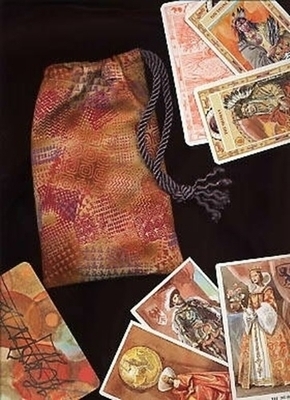 Many oracle decks have either colors or patterns that match this attractive bag. Some such pairings are the Osho Zen Tarot, Native American Cards, and Tarot of the Renaissance. In addition, many of the cards in the PsyCard deck match this bag in color or pattern. Size: Small, approx. 4-1/4 inches x 7 inches.